A couple of weeks ago I was asked to stand in for a small chorus role in my first opera chorus at the Royal Conservatoire of Scotland, it’s very exciting for me. Rehearsals had been going on since the beginning of January so I had catch up work to do. The lovely Kathryn Middleman, a fourth year vocal student and friend, helped me with some of the Italian pronunciation. The opera is called La Rondine (The Swallow). I haven’t seen this opera yet on DVD or live, the music is by Giacomo Puccini. I immediately set about listening to the music and I’d like to get a copy of the opera to watch, I doubt it will be featured at a cinema in time for May, the music is just sumptuous. The first performance of this opera was at the Casino Theatre in Monte Carlo on 27th March, 1917. The story seems to have lots of secret love affairs and is about romanticism and love. It’s set in glamorous 1920s Paris. An elegant courtesan Magda de Civry meets the young innocent Ruggero Lastouc, she is smitten, and begins to imagine the life they might live together. But can she forget her past and make her dream a reality? My initial investigation into the story reveals that in act one Magda, a working girl who became the elegant mistress of her elderly protector Rambaldo, entertains her friends with a cocktail party at her home. She invites a poet called Prunier to sing a verse of his latest song and Magda sings her own ending to the song. A visitor arrives at Magda’s salon to see Rambaldo called Ruggero, it is his first visit to Paris and he asks where to find the best entertainment for his first evening, Magda’s maid Lisette recommends Bulliers. In Act two Magda disguises herself as a working girl and goes to Bulliers for an evening of dancing. The bar is packed with students, artists all singing and dancing. Magda sits with Ruggero who doesn’t recognise her, she becomes smitten with him and dreams of building a life with him. The maid Lisette and Prunier the poet arrive, Lisette thinks she recognises Magda but she has signalled to Prunier not to reveal her so he persuades Lisette that she is mistaken. Prunier noticed that Rambaldo has entered Bulliers and implores Lisette to take Ruggero out of the room for a few minutes, which she does. Rambaldo implores Magda to leave with him but she declares her love for Ruggero and he leaves. In Act three on the French Riviera Magda and Ruggero have been living together for several months. Ruggero tells Magda that he has written to his mother for her consent to his marriage to Magda. Magda becomes uneasy because she knows her previous life as a courtesan would make her unacceptable to his family. Prunier visits Magda and tells her that Rambaldo is happy to take her back on any terms. Magda at first refuses to listen. She confesses to Ruggero about her past and declares she can never be his wife. He implores her not to abandon him in a heart-breaking farewell. Like a swallow, she flies back to Rambaldo and her old life, leaving Ruggero behind devastated. One aspect of this opera that I look forward to is the dances in Act 2, La Rondine uses popular dances, and particularly the waltz and I love to waltz. A feature of the music is Puccini’s use of modern dance rhythms, such as the tango to denote the various characters. 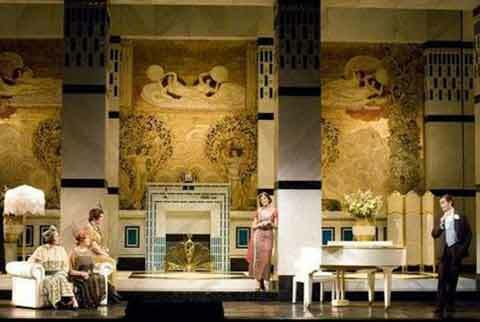 La Rondine has been one of Puccini’s less successful works, however, as part of a 1958 celebration marking the centenary of Puccini’s birth the San Carlo Theatre in Naples, Italy staged a revival which was well received, with audiences and the critics deeming it was a success. You can read more Musical Highlights here by The Metropolitan Opera to help students make sense of opera. La Rondine runs at the RCS from May 10th to Thur May 15th ,2014. 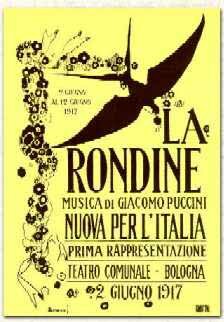 La Rondine hasn’t been performed or seen in the central belt of Scotland for many years. As Puccini’s homage to operaetta it represents him at his most delicate, lyrical and playful in portraying a tangled web of human relationships, deceit and misunderstanding. You can book tickets for the RCS production here. Very good ! very nice ! very interesting, My best wishes and my best thought with you Charlotte !! Thanks Pascal. Lots of time on the train home to Glasgow to catch up on my listening and reading ;). It was beautiful and sunny this weekend in North Wales and with my parents, nice to get outside and enjoy the warmth. Yes it is, I’ve dreamt of being in an opera, it’s nice to be involved. Wonderful opportunity, Charlotte. This looks like an exciting production to be involved in, and I wish you all the best and trust you’ll enjoy the experience! Cheers Arti, I read your book review on The Book Thief it was excellent. I am looking forward to see pictures of you in the show. Best of luck! I have seen this opera a couple of times in the last few years (ROH and Opera Holland Park). It is great fun and and has a lot of charm. Also it has a rare ending: the soprano makes a sensible (if sad) decision, she remains in charge of her life, she does not die and the tenor is left disconsolate – but also alive. No doubt the lack of life and death drama has made it less popular, but I have grown very fond of the music. I have the Gheorghiu and Alagna MET DVD. I hope you have great fun and it is the first of many operas. Hi Hilary, If you had to chose one DVD to watch (for the full cast as much as the main sop) which would it be the Gheorghiu or Alagna one? Sorry, only just seen this. It is all one DVD Angela Gheorghui (Magda) and Roberto Alagna (Ruggero). Alagna was her husband and although they separated, I have a feeling they may have got back together again. They make a great team. Thanks Paul, that sounds so exciting did you get the opportunity to watch all the productions? If so which was your favourite? Congratulations on your first opera appearance. That is very exciting. Great, Charlotte, and congrats on your first operatic appearance, can’t wait to meet you in person here or in the UK someday! Thanks Lizzi, I’d love to be performing all over the world that is my dream. I am very happy for you Charlotte, you must be thrilled! I am thrilled Tony and thank you. This sounds wonderful and it’s great you get to be a part of it! Congratulations and best wishes! I hope you can post a video of your performance on the blog. I’d love to but I don’t think there will be a recording sadly. My parents are going to travel up for one of the nights which is lovely but my younger brother will be in the middle of his A level revision so I don’t think he’ll be able to take the time off! Yikes that brings back memories. Congratulations. That is exciting news. I am sure you are learning a lot. I am not an opera fan. But I do like Puccini. He wrote some lovely music. It’s all fabulous experience and just reaffirms what I want to do. Looks and sounds really exciting, hope you enjoy every moment. Congratulations !!!!! Wow, what a great opportunity for you, Charlotte. Congratulations! Thanks Matt, I’d accepted I hadn’t got in so to get the call was brilliant. Ooh wow this is fantastic.Congratulations Miss Charlotte. Yeah You. Exciting!!. Keep on smiling. Every time I see your gravatar I keep thinking I must record the folk song ‘The Three Ravens’ so you can have a listen 🙂 I’m always smiling even when I’m sad. But fake smiles can never sparkle when tears take their shine away. That is so sweet of you to think that 😀 I would love to hear it. But no pressure. Outstanding – best wishes for the opera. Thanks Jerry, how wonderful to do your traveling, beautiful photographs. Thanks Iris for your good wishes, I’ve not read ‘The Winter’s Tale’ although I did read the whole set of Shakespeare for children, my Mum bought me a huge book full of his work but it was just too heavy to hold. Very cool, wish I could be there but instead will be there in spirit! I’m so excited for you Charlotte!! Have lots of fun and enjoy every moment rehearsing and performing on stage! 🙂 Also, thank you for the detailed synopsis. Very interesting, down-to-Earth, story. Sounds like fun. You’ve had some lovely comments Charlotte, well done you! I have some great friends in the blog community and I’m always very grateful for the messages 😉 thanks for joining in Gill. How wonderful. And I enjoyed Phil’s link! Thanks Dianne, beautiful version by Kiri Te Kanawa glad Phil showed me the link. 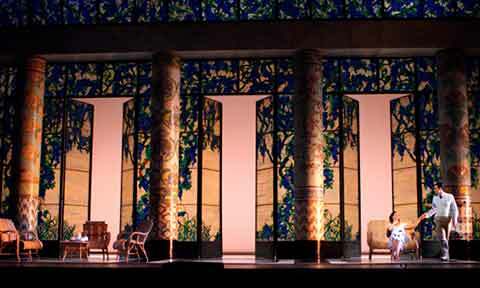 The sets look superb, and the opera seems to have all the elements of one that should have been successful. Do tell us if you are particularly impressed by any particular pieces from it – not so much from the technical as from the enjoyment point of view! Congratulations! Sounds like a wonderful opportunity! I’m really enjoying rehearsals thanks Kristen. Congratulations and best wishes for a noteworthy career.